​The Urban Raptor Research Project was created to study migration patterns, reproductive success, dispersal, and more through the collection of data and banding of raptor species. This project is primarily based out of the greater Grand Forks, ND and East Grand Forks, MN area to gain a better understanding of how raptors have adapted to an urban environment. Birds are banded for a variety of reasons but are typically banded for research and management projects. 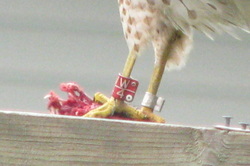 The bands help to identify individual birds and track their movements through sightings (and sometimes GPS). This can help scientists track migration, natal dispersal (young moving away from the nest site), reproductive success, life span, physiological development, social structures, and much more. For more information on banding, procedures, permitting, and more, please visit the Bird Banding Lab's website. Peregrine Falcon chick banded in 2016 at the University of North Dakota water tower. Please report any banded birds you encounter to the Bird Banding Lab. If you see a banded bird that might be nesting in your neighborhood, please let us know directly through our Contact Us page.